The area that I chose to highlight was the exotics! There were so many things that I had never used and I knew I could have some fun with these. When Mike from Savory Spice Shop suggested highlighting the Korean Black Garlic, Juniper Berries or Fennel Pollen, he joked about using them all in one dish. I had no plans to but as I got to thinking I came up with a great idea to highlight the unique flavors of all of these great ingredients. This stuff really is black, and is so different than anything I expected. It's almost sweet and then has a garlic aftertaste. It has a gummy texture and really almost could be a snack food. It's not really a direct replacement for garlic but can be used in similar dishes. I used the garlic in the ragu and while it certainly wasn't highlighted in this dish, it still provided some sweetness. I was really excited to try this one. I've heard so much about it and really wanted to find a way to highlight it's unique flavor. Like fennel seed, it has a licorice flavor but it is much smoother and just feels more luxurious. It grows wild throughout California and has so many uses, I just couldn't wait. I absolutely loved the pollen mixed into the pasta. It not only added a great texture to the pasta but it provided that subtle flavor all the way through the dish. Each of the Virtual Potluck team is giving away a different prize pack from the area of the shop that they reviewed. 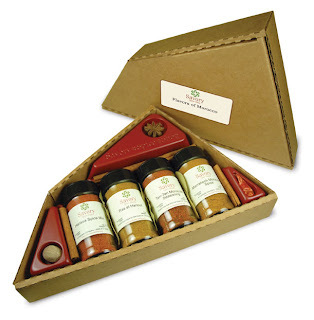 My gift set is Flavors of Morocco, a great set of combinations to add some new spice to your dishes. Preheat oven to 325°F. Sprinkle oxtails with salt, pepper, and fennel pollen, then flour. Heat oil in heavy wide ovenproof pot over high heat. Add oxtails; cook until brown on all sides, about 15 minutes. Transfer to bowl. Add celery, carrots, and onion to pot. Reduce heat to medium-high and sauté until vegetables brown, about 15 minutes. Add juice, vinegar and tomatoes. Boil until thickened to chunky sauce, about 5 minutes. Stir in garlic, juniper berries, parsley, rosemary and bay leaves. Return oxtails to pot in single layer. Add all broth; bring to boil. Cover pot; place in oven. Braise oxtails until very tender, about 2 1/2 to 3 hours. Transfer oxtails to rimmed baking sheet. Using potato masher, crush juices and vegetables in pot to coarse sauce. Pull meat off oxtails and add to sauce. Season ragù with salt and pepper. Make a well in the center of the flour and add the eggs, fennel pollen and oil. Mix together until it combine and then knead until it becomes smooth, 4-5 minutes. Wrap and place in the refrigerator for at least 30 minutes. Roll out and run it through a pasta machine and cut. Disclaimer: I was provided these spices and the gift pack free of charge. The opinions are my own. So impressive, Matt! Looks great! Oxtail really is the best and most under used protein. I love it...and my kids do too. Great recipe Matt. This looks really amazing. Glad I found you through Donna's page (Cookistry). The only you used that I have tried is juniper berry, but I think they really do go well with venison (which I happen to cook with quite often). Cardamom is my favorite spice, but I've never tried any black cardamom, so that would be my choice of a new spice to try. I have liked Savory Spice Shop on Facebook. I would love to use the Marrakech spice in couscous and serve it with beef for my French husband. He had a Moroccan friend growing up in France and still raves about the couscous they served! Very impressive! Curious to try fennel pollen now. I've never made oxtails but this sounds amazing! Nice job incorporating the spices. Cardamom is one of my favorite spices - but the black garlic - that would be interesting to try - I love garlic. I liked Thyme on Facebook. I liked SSS on Facebook! I followed SSS on twitter! I've always been curious about cardamom and I have a terrific recipe for Cherry Cardamom Pie that I'd love to try with Savory Spice's variety. I checked your section, and I would like to try the horseradish powder. I would love to learn different dishes to use this in. I follow Savory Spice Shop on Twitter. I now follow Savory Spice Shop Online on Facebook. Must confess black garlic has always kind of scared me, so I'd have to face my fears. Great photography and a beautiful recipe! Nice job! I'd like to give the Hibiscus Flowers a try! From your Virtual Potluck section, I would try the Cracked Galangal Root because I have heard about it but never tried it. I think the Juniper berries sound pretty good.